Firstly let's start with a few hards facts regarding what I'm about to mention to clear up yet another of the misconceptions surrounding playing salmon. On the few occasions that I've witnessed salmon not surviving the trauma of being caught have been when the angler has fiercely bullied them to the net and the fish has gone berserk and completely beat itself due to the stress and strain of resisting. The other instances when I've seen salmon not surviving the fight have been during warmer water conditions when an angler hasn't used 'common sense' in getting the salmon back into a good oxygenated stream flow to revive and then release the fish. On most of the fight footage videos I see there's usually always a fisher or ghillie standing out in the river with a landing net after only a few minutes of the fish being hooked. On average it's about a pound of salmon body weight per minute of battle so unless you're only catching very small grilse leave the landing net alone and stay away from the battle scene until the time is right. There's much more personal or commercial value for whoever is landing the fish to pull out their camera and shoot a video which takes the pressure 'off' the angler and captures the special moment of playing a salmon. Nothing puts more pressure on an angler and reduces the enjoyment of the salmon fight than a non thinking colleague standing out in the river way before the salmon is anywhere close to being ready for landing. Not only does that kill the 'fight experience' for the successful fisher but it can 'panic' a salmon at a time when it's still got full battery power! Stay out of the way until the salmon fight appears to be coming to an end would be my advice. 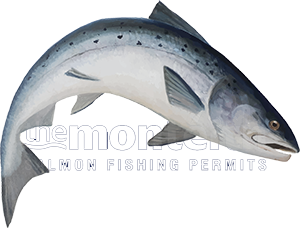 You'll know when the time is correct to be thinking about landing any salmon as the fish will be under control and showing its flanks near the margins of the river. If you play any salmon with a reasonable bend in your rod the action of the rod will beat the fish for you. Just like ourselves fish also get a build up of lactic acid in their muscles following exertion so all salmon will eventually tire and can be easily landed when the time is right. With a big fish just take your time and don't try to rush it as you could be 30 minutes or more with some of them. Playing your salmon from a side on position increases the chances of a successful outcome as does shouting any salmon landing 'assistance' back out of the river if you see that happening way too soon into proceedings!